Here, you can post updates to the campaign as well as send a note to all of the supporters in that campaign with the update. In Add New Update, you can add an update to the campaign. Once an update has been created, you can save it as a Draft and see it in the Drafts (3) section, or you can publish and later view it in the Published Updates (2) section. There's also a Deleted Updates (4) section in case you ever need to go back to an update you have deleted. To add an update, you can pick the date to be listed on the update, set a Title, and in the Body area enter the update. You can also use the rich text formatting tool bar at the top, and add images or videos. Before hitting "Save to Drafts or Publish" you will have the option to email-blast this update to your supporters as well. 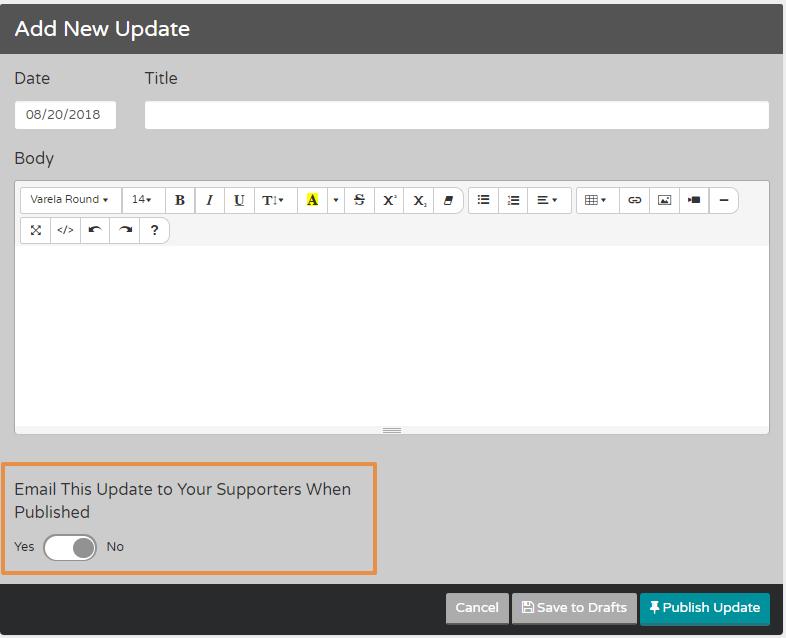 On the bottom right you will see a toggle to Email This Update to Your Supporters When Published. Toggle to Yes if you want to email the update to everyone who has participated in this campaign. Don't forget to hit "Save to Drafts" or "Publish Update" once finished! You have the option to display your Update(s) in your Integrated and/or Hosted appearances. 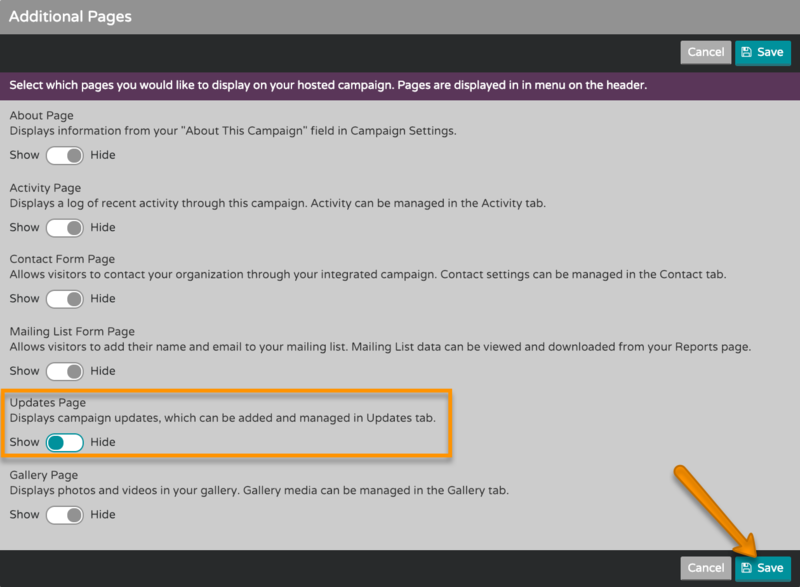 For Integrated campaigns, click Integrated Appearance > Additional Pages > Updates Page then switch the toggle to "Show". In your Hosted Campaign(s) you can display your Update(s) on the Homepage or on an Additional Page. To display on the Homepage click Hosted Site Appearance > Additional Pages > Updates Page then switch the toggle to "Show".